THANK YOU to Mayor Tom Poynton who has taken the Mayor’s Monarch Pledge. Lake Zurich is now in the Mayor’s Monarch Leadership Circle. The monarch butterfly population has declined by 90% in the past 10 years. This is mainly due to a decrease in milkweed habitat which is needed for reproduction and as a food source for caterpillars. Overuse of pesticides is also a contributing factor. But the Save the Monarch program seeks to reverse this trend through awareness and, more importantly, giving humans the tools needed to help save the monarch in their own back yards. The Ancient Oaks Foundation is heading this effort here in the Lake Zurich area. 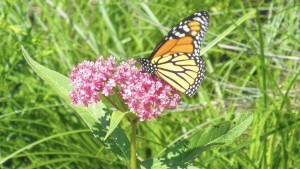 We have already established several butterfly friendly gardens in Lake Zurich. While supplies last: Free Milkweed Seeds. Fall and winter are the perfect time to plant milkweed seeds. These plants are the only ones used for monarch egg laying so their importance cannot be over stated. Their pink globe-like flowers are lovely and will add a touch of whimsy to your yard or garden. Contact us to receive a free packet.